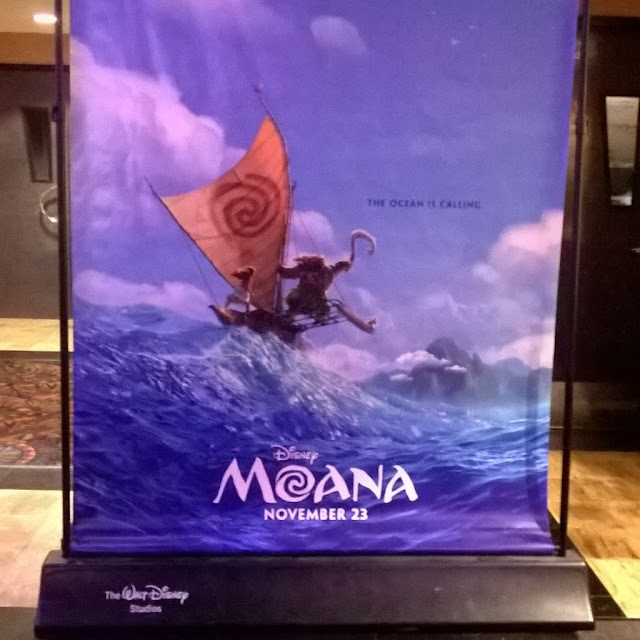 Disclaimer: On 11/16/16, We were invited to an advance screening of Disney's Moana, by Allied Hispanic, with the purpose of writing our honest opinion about our experience. I am not going to lie, it is a bit hard to share my experience after watching Disney's Moana, mostly because I feel like if an explosion of emotions had clashed at once into a waterfall of magic inside of me. So please bear with me, as I will do my best to describe what I felt without actually spoiling this movie for you. Before the movie even begins, you will be able to enjoy a seven minute animated short, called “Inner Workings”, written and directed by Leonardo Matsuda. This short is about the constant inner battle many individuals may have when trying to separate the monotony of a routine, with experiences that may be a bit more fun, leading to happier moments. In other words, this short animated film demonstrates the different perspectives between what the head wants, and what the heart wants. From the artistic point of view, I really enjoyed the mixture of 2D and 3D animation throughout the short. The mood created by the music, character interaction, and the story itself, was great. I believe it was funny in many ways, because we can all relate to what the main character in the short, “Paul”, is going through. I would definitely say, that you can expect to laugh several times throughout this animated short film. Soon after, the wonderful thematic music of 'Moana' begins, magically inviting you into a beautiful and colorful paradise, filled with cultural riches. With the feel of the music, it was very easy to let go, and allow myself to be submerged into the story. I don't know much about the Polynesian culture, but I felt very honored to have experienced such a wonderful story with their cultural background. I have always believed that the diversity in cultures makes humanity very rich, and that is why, bringing those elements into this film for the rest of the world to see, was such an indescribably marvelous experience. I have always been drawn to music with the belief that it can be used as a powerful tool that can literally take you anywhere throughout space and time. Lin-Manuel Miranda, did an incredible job writing the songs for this film, which set the right mood for the different scenes in which they are being performed. Songs like; “How Far I'll Go” and “We Know the Way”, were very inspiring and exciting. The song, “You're Welcome” performed by Maui, was funny in a vain kind of way. I don't know why, but the feel of this character, kind of reminds me of Hercules, but with more ego than the Greek Demigod. I am still singing the choir of this song at home at least twice a day, and every time I say “you're welcome”. I think that Dwayne Johnson did a fantastic job giving life to Maui with his charismatic voice and personality. Now let me take a deep breath, exhale, and prepare to share one of my favorite parts of this movie. I won't specify what happens, because I don't want to spoil the movie for you. Nonetheless, and of course, it has to do with a song. You know that feeling you had when Ariel performs “Part of your world”, and Elsa sings “Let it go” with all her heart? Well, that's exactly what happened to me when “I am Moana” is being performed by Auli'i Cravalho. That is why I compared it with previous Disney movie moments. It is simply, because there are no words to describe the very touching and heartfelt moment that leads to that song. Yes, yes, I did cry. I will remember to use waterproof mascara the next time I see Moana, because I know I will want to watch it over and over and over again. I feel within my heart, that you can expect a lot of little girls to be inspired by this same scene, and end up singing this song nonstop. Then again, many of us not-so-little girls, may end up singing this song nonstop as well. To be honest, Auli'i Cravaho's voice is so gracefully appealing to me, that I truly enjoyed every song she performed for this film. It made me want to learn the lyrics of this song like yesterday. We watched this movie on 3D, which I have to say was a very pleasing experience, considering that I don't like watching movies in 3D that much. The depth of different scenes makes you feel like you are one step closer of getting inside of them, which is an incredible feeling. Visually, the movie is everything you expect from a Disney film. Vibrant and soothing colors that creates an accurate ambiance to follow the story line. There is a mixture of animation styles, which I have noticed The Walt Disney Studios using more often, making it a very enjoyable experience for spectators of different generations. In terms of visual stimulation, I loved all of it. The animators and artist did an amazing job in creating this film. Their work really invites you into the story, making you feel as if you are part of it. That is something that is just very distinctive about Disney, it's pure magic anyway you see it. The story itself is beyond touching. The fact that the base story wasn't taken out of a classic fairy tale made it intriguing, because many of us didn't really know what to expect. I think this was a huge factor towards allowing ourselves to be amazed. I kept on hearing from individuals at the movie theater, on how long they had been waiting for this film, and in many ways I can understand why. There were a couple of cultural similarities from this story, that reminded me of a Mexican Legend. I believe Moana will open many doors towards unexplored stories within so many inspiring cultures that are awaiting to be told, and that only Disney knows how to bring to life. With that being said, a standing ovation is in order. Though most of the time we fall for the main characters, I must say that I was not expecting to be so amazed by two of the secondary ones. Moana's grandmother 'Gramma Tala' and with 'The Ocean'. From the first moment that the character of 'The Ocean' makes a presence, I just knew I wanted to interact with it too. Both characters were somehow intertwined, and I think that connection made me feel more passionate about their interaction. You'll know what I mean once you see the film. I hate to do this, but there was just a tiny little thing I didn't quite like in the movie, that I just felt like I had to share, just because I was not expecting this to happen in a Disney movie. **The following sentence may contain a vague spoiler. ** There is a moment in which Moana gets annoyed by something Maui does, and she says "You son of a--" and gets interrupted before she finishes the phrase. I don't know why a children's film would even consider implying a phrase like that. Now don't get me wrong, I adored this movie. However, there are many ways in which the writers could have reflected Moana's frustration, without using a phrase like that. I have to be honest, as this is in a way a review. I think that if that phrase was changed, this movie would be quite perfect in every way. I also noticed that certain character postures, and some color schemes reminded me of previous Disney movies, such as; Tarzan, and Atlantis. Both of which are in my top favorite Disney movie films of all times. However, for me, this became a new favorite movie and here is why: I love all Disney movies, there is no doubt about that. Nonetheless, very few have gotten me to the point in which I feel the need to know more about the story, and as crazy as it may sound, even be part of it. The last time I felt this exact way, was in 1990, watching Disney's The Little Mermaid for the first time, while sitting next to my grandmother at the movie theater. That is why it is so very hard to say the right words to describe this extraordinaire experience we had while watching Moana, because it transported me back into my childhood, and overwhelmed me with joy and happiness. I just love the fact that Disney finally added a grandparent-grandchild interaction in one of their movies. This was literally my favorite thing. 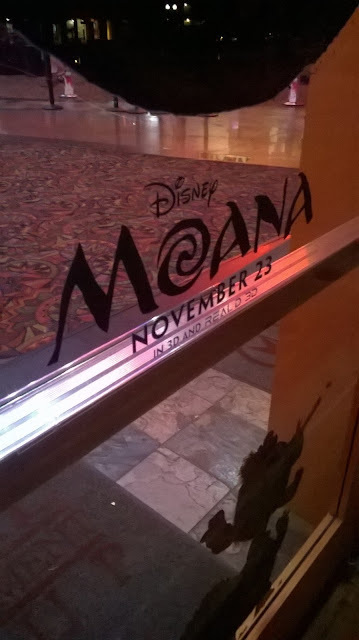 All I can say is that I am sure you and your family are going to have a great time while watching all new Disney's Moana, and that I hope you love it as much as I did. To find out more about the characters and the movie, read our previous blog post by **clicking here**. Thank you for joining our Just Happiling community. I hope that you find this blog post useful. Are you very excited about this film? Let us know in a comment, we would love to hear your thoughts. Until next time. Great review! I still haven't seen it yet!